"I am very impressed with the versatility, reliability, reproducibility, and short-term outcomes of this implant. The streamlined and reliable operative instruments and techniques of this procedure, combined with anatomical design, offer significant advantages over other ankle systems on the market today." Integra is dedicated to eliminating uncertainty for clinicians so they can concentrate on providing their best patient care. Integra offers innovative solutions, including leading plastic and regenerative technologies, in specialty surgical solutions, orthopedics, and tissue technologies. Acumed is an award winning company dedicated to innovative and quality medical device solutions. Acumed is a global leader providing orthopedic and medical solutions that improve patient care around the world. Acumed Acu-Loc2 Wrist Plating System is a comprehensive system designed to treat multiple fracture patterns of the distal radius and distal ulna. The Integra External Fixation System is a single-use modular external fixator. It has an enhanced, ergonomic design to promote simplified & accurate application with reduced surgical operative time. Rigid construct produces positive outcomes in challenging Charcot cases. Hinged component constructs address post-op wound maintenance and care. The Acumed Posterolateral Plates are specifically designed for isolated capitellar fractures and for surgeons who prefer a 90 degree-90 degree plate application. A precontoured bend in both the diaphyseal region of the plate and the lateral tip to support the anatomy, while the unique, diverging screw geometry of the distal hole cluster allows for maximized fixation at the fracture site. The Acumed Medial Column Plates are designed to offer fixation and compression of fractures of the distal humerus by extending down distally, or wrapping around the media epicondyle and extending up the condylar ridge. This fixation is maximized when the screws in the articular fragments interdigitate with the screws from the Acumed Lateral Column Plate on the Lateral side. The Acumed Lateral Column Plates improve upon the biomechanics of the posterior plating by enabling longer screws in the articular fragments to interdigitate with screws from the medial side. When used in conjunction with Acumed Medial Column plates, the construct acts as a template for complex fractures of the distal humerus. The Total Wrist Fusion Plating System was designed for wrist arthrodesis due to deformities associated with degenerative arthritis, brachial plexus palsies, and spastic disorders. This five plate system features both innovative and traditional designs. 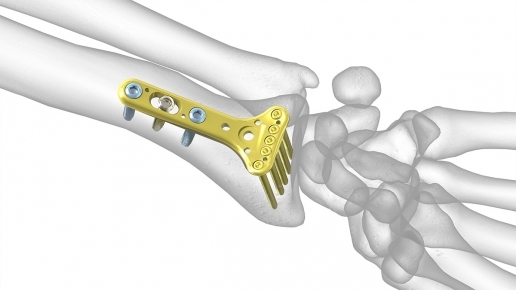 The Acu-Loc Wrist Spanning Plate is designed to address complex distal radius fractures. This temporary fixator is designed to hold the wrist in distraction and to provide ligamentotaxis to the wrist on a temporary basis while the distal radius heals. Similar to an external fixation device, the Acu-Loc Wrist Spanning Plate may be used if the distal radius is too comminuted for an Acu-Loc 2 or other distal radius plate. 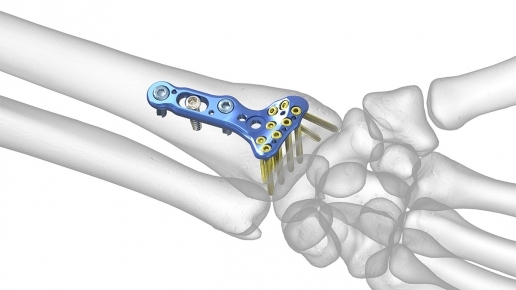 The Acu-Loc Extra-Articular Plate is designed for extra-articular distal radius fractures and osteotomies. The plate sits more proximally than the standard Acu-Loc Volar Distal Radius Plate, and its distal locking screws are angled to support the dorsal lip of the radius, maximizing purchase in the subchondral bone. The 2.3 mm Variable Locking Screws can also be used in the distal holes of this plate family. The Acumed Acu-Loc Distal Plates are designed for complex distal radius fractures that need to be addressed from the dorsal side. The plates are anatomically contoured and may help restore the bone's natural anatomy from the distal ulnar side to the radial styloid. In addition, the distal cage of screws - with fixed angle locking technology - are designed to help support the fracture. The Acumed Acu-Loc Distal (VDR) Plate has been a market leader since 2004. 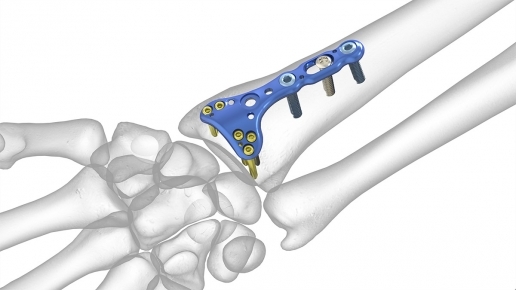 Designed to provide a more distal fit than many other volar plates, the Acu-Loc Volar Disal Radius (VDR) Plate offers an innnovative solution for complex intra-articular distal radius fractures and osteotomies. The Acu-Loc instrumentation supplies surgeons with everything necessary to implant all of the distal radius and volar distal ulna plates. Acumed Distal Radius Fragment Specific (DRFS) Plates are designed to independently address the fractures of the intermediate and radial columns. The modular nature of the plates, which include the Dorsal Rim Buttress Plate, Dorsal Lunate Plate, Volare Lunate Suture Plate, and Divergent Radial Styloid Plate, allows compression of fracture fragments from multiple directions. The Acumed Arc Wrist Tower is designed to provide stable traction of the patient's forearm and hand, allowing unrestricted access to the wrist during arthroscopic and fracture-reduction procedures. The support arm swivels 180-degrees about the patient's elbow and forearm, allowing for flouroscopic imaging from any angle. The Acumed Acu-Loc 2 Proximal Volar Distal Radius (VDR) Plates are designed for distal radius fracture and osteotomies, as well as segmented diaphyseal fractures. Customizable plate length and width options allow for sizing of varying patient anatomies. In addition converging ulnar screws, suture holes, and K-wire holes have been incorporated to support the volar ulnar lip and lunate facet. The 2.3 mm Variable Angle screws can also be used with this plate family. 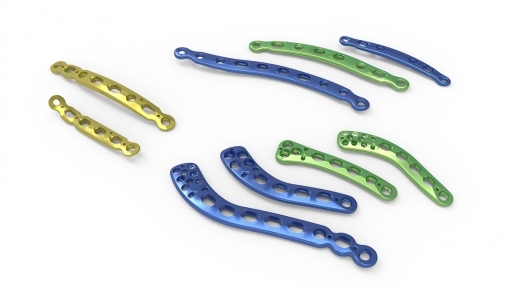 The Acumed Acu-Loc 2 Standard Volar Distal Radius Plates have an optimized design to closely replicate the anatomical contours of the distal radius and assist in restoring its natural geometry. Other optimized features include a lower profile, polished finish which may help minimize soft tissue irritation, and converging ulnar screws, additional suture holes and added K-wire holes for provisional fixation. Acumed Acu-Loc 2 Extension Plates are designed to lock to Acu-Loc 2 Proximal VDR Plates to provide rigid fixation of segmental fractures of the distal radius that extend into the diaphyseal region.The proximal plate end is tapered and the undersurface is designed for limited contact with the bone. 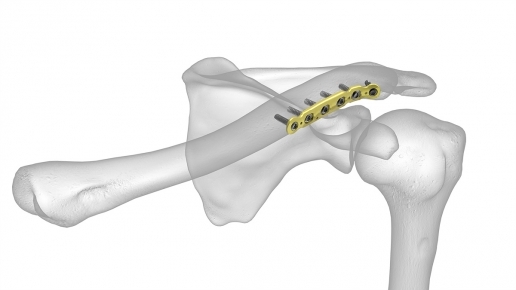 Acumed Superior Midshaft Plates offer an array of plate options for superior midshaft clavicle fractures, malunions, and nonunions. 16 plates in 8 lengths and 2 different widths provide the surgeon with a comprehensive plating system. In addition, the design of the plates and their orientation to the clavicle provide biomechanical stability. Acumed Dual-Trak Clavicle Screw System is a fully intramedullary solution for simple middle third clavicle fractures. 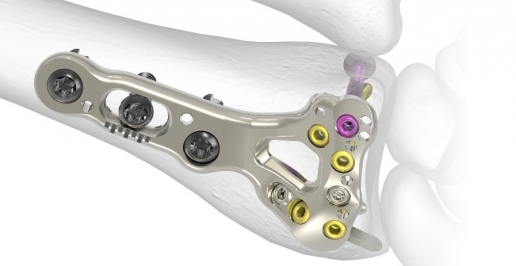 Designed to provide fracture stability and restoration of anatomical alignment, this minimally invasive implant may reduce hardware irritation and provide and maintain compression, which can benefit both the patient and surgeon. The Acumed Dual-Trak Clavicle Screw System and the Acumed Clavicle Plating System provide comprehensive solutions to treat a wide variety of clavicle fracture patterns. The Acumed Distal Clavicle Plate is designed to provide fracture fixation and stability for lateral third clavicle fractures, malunions, and nonunions, and where there is disruption to coracoclavicular (CC) ligaments. Multiple distal screw configurations are designed to achieve construct stability, while screw positioning targets distal fragments to provide secure, stable fixation for multiple fracture patterns. The Acumed Clavicle Plating System provides surgeons with the ability to address acute fractures and malunions of the clavicle with 33 different clavicle specific plating options. The Clavicle Plating System offers low and narrow-profile plate solutions that are precontoured to match the natural shape of the clavicle. Acumed Anterior Clavicle Plates are designed for surgeons who prefer an anterior approach to treat malunions, nonunions and fractures of the medical, midshaft, and lateral third clavicle. These anatomically contoured plates increase screw purchase in the clavicle and act as a template to aid with anatomic restoration. In addition, the low-profile design may help minimize postoperative soft tissue irritation. Acumed Ankle-Plating System 3 is designed to provide a variety of fixation options for fractures of the distal tibia and fibula. 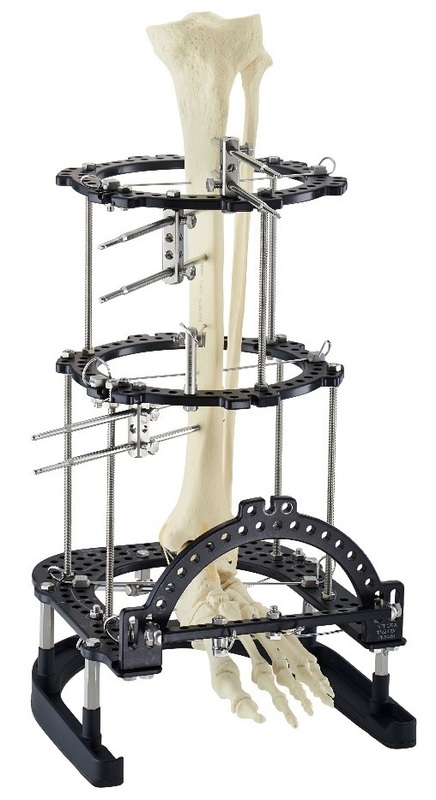 Designed in conjunction with Anish Kadakia, M.D.and Bruce Ziran, M.D., the system is composed of seven plate families designed specifially for the treatment of ankle fractures. The indication-specific plates address fracture patterns of the medial, lateral, and posterior malleoli. Specialized plate features and unique instrumentation address disruption of the syndesmosis. 4.0 mm cannulated screws in lengths of 36 mm, 42 mm, and 48 mm are also included in the tray for the treatment of medial malleolar fractures. 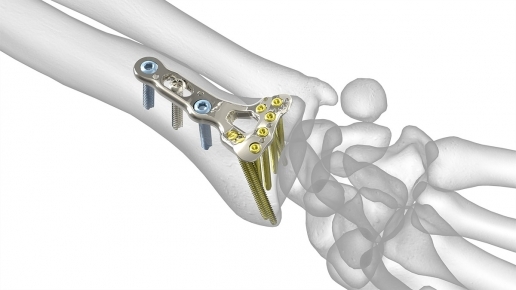 The Ankle Plating System 3 is used in combination with the Acumed Small Fragment Base Set. The Acumed 3.5 mm Reconstruction Plate is made available in 3-16 hole configurations, providing an array of options to address many different fracture patterns within the pelvis. Additionally, these plates can be contoured and trimmed as necessary to further accommodate the various regions of the pelvis. In order to allow for the treatment of a wide variety of pelvic fractures, the Acumed 3.5 mm Interlocking Reconstruction Plate is designed to overlay other plates in the Pelvic Plating System.